The band which practically invented the genre of dark alternative metal, Alice In Chains bridged the gap between the “traditional” heavy metal and the new, alternative inspired “fusion” metals which began to proliferate in the 1990s. With their second album, Dirt the band really came of age. The album was very well received by music critics and sold well commercially, having been certified platinum four times over. Like their 1990 debut album Facelift, this album was produced by Dave Jerden, with songs primarily written on the road prior to entering the studio. Guitarist Jerry Cantrell has stated that Dirt was the band’s best work. The band’s roots date back to 1987 in Seattle when Staley first met Cantrell in 1987. In between the band’s debut in 1990 and Dirt in 1992, Seattle suddenly became an international “scene” with the phenomenal success of bands like Nirvana and Pearl Jam. As a result, Alice In Chains were suddenly marketed as an “alternative” band, instead of their traditional heavy metal billing in order to help build anticipation for the new album. This strategy worked because the band was hard enough for metal fans, yet dark and punk-influenced enough to join the ranks of the grunge bands. Dirt balances heavy rock sounds with textured acoustic numbers and the album spawned five singles; “Them Bones”, “Down in a Hole”, “Rooster”, “Angry Chair”, and “Would?”, the album’s closer which was actually the lead single. Starting with an excellent bass by Mike Starr (who left the band after the album’s release) “Would?” works its way through fine verses and choruses before it ends abruptly following a climatic bridge. The song was written in memory of Andrew Wood, the lead singer of Seattle band Mother Love Bone who died of a heroin overdose in 1990. “Down in a Hole” contains some eighties-style guitars (unique on the album) and maintains a very slow drum beat by Sean Kinney, leaving all of the movement to the guitars and bass. Cantrell was at first hesitant to present the song to the band, feeling that it may be too “soft”, but surprisingly got a positive response and they recorded it. “Angry Chair”, written by Staley, is more riff and accent oriented. “Rooster” is the most purely alternative, and perhaps the strongest overall song on the album. It is slow and moody with deeply chorus-saturated, strummed guitars which later give way to piercing, distorted, heavy guitars. Lyrically, the song paints a masterful picture of Cantrell’s father and his Vietnam experience. Jerry Cantrell Sr. went by the nickname “Rooster” since childhood, which coincidentally was also a common reference to men carrying the M60 machine gun due to the the muzzle flash from which makes an outline or pattern reminiscent of a rooster’s tail. The constant alternating between the dreamy verses, and surging, explosive choruses masterfully captures the fits and starts of combat, especially the first person experience in Vietnam. 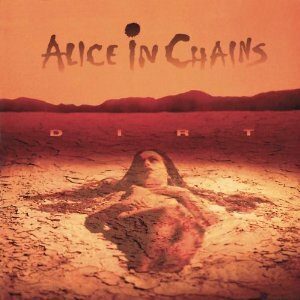 Dirt is commonly seen by fans as Alice in Chains’ album dedicated to the experience of heroin use. Honestly, the whole junky thing does get old when beaten to death and it feels at times like going into the darkness is just a game to the composers. From the listener’s point-of-view it may get to the point of like watching a stale old movie plot, reused over again. This is especially true during a sequence of songs later in the album starting with the Black Sabbath-esque “Junkhead”, followed by the suicidal “Dirt”, and “God Smack”, which does redeem itself partially by actually celebrating the joys of heroin abuse and stepping away from the doom-and-gloom for one song. “Hate to Feel” almost sounds like it belongs in some kind of rock opera, and briefly rips off “Dazed and Confused” during middle. It is this bit of repetitiveness that holds the album back a step from full-fledged classic status. All that being said, the album was a critical success and is often considered to be one of the best rock records of the 1990s. Although the band’s status and artistic output continued through the better part of the decade, the underlining issues never really went away. The band ceased touring soon after the release of Dirt, Staley later also disappeared from recording and the group never did quite fulfill their potential. God Layne I miss you so much. Hope you’re at peace now.